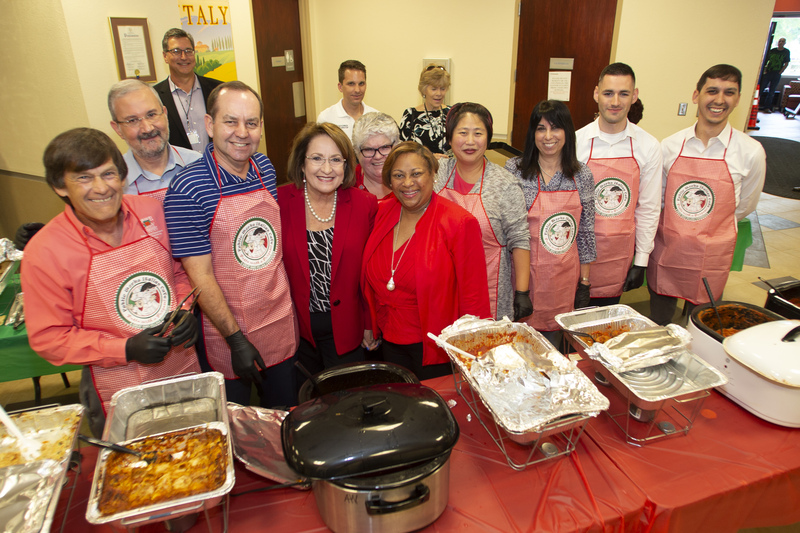 Employees from across the County joined the Orange County Public Works Department for their annual Pasta with a Purpose event on Sept. 19, 2018. Orange County Mayor Teresa Jacobs and Orange County’s Director of Public Works Mark Massaro – who oversees the annual fundraising luncheon – welcomed more than 300 employees to the sold-out event. The signature employee luncheon benefits Orange County’s Great Oaks Village (GOV), a residential foster group home for children, 6 to 18 years old, who have been removed from their homes by the State of Florida due to abuse, neglect or abandonment. The relationship between Orange County Public Works and GOV spans 25 years. Pasta with a Purpose was started by a committee of Public Works staff. Over the last eight years the department has prepared a true Italian luncheon for employees with the highlight being the homemade sauce made by Massaro. The department organizes several fundraising events for GOV throughout the year, but Pasta with a Purpose is by far the division’s largest fundraising event, raising more than $17,000 in 2018. Orange County’s Public Works Department is composed of more than 540 employees and seven departments including development engineering, public works engineering, highway construction, traffic engineering, roads and drainage, storm water management and fiscal and operational support.